I had Ms10s Angry Birds birthday party yesterday. One of our activities was “Who’s more clever – Birds or Pigs?”. There were 3 logic/maths questions – in QR code form -and Q1 must be answered correctly before going on to Q2 and eventually Q3. I needed to divide the 10 girls into 2 teams and initially planned to do this by drawing strips from a bag (strips with either pig or bird on it). With all the party preparation, I didn’t get ’round to making these so had to quickly think on my feet. I hit on genius. There were lots of suggestions including birthday month which eventually won. Interestingly, there was a girl who pleaded not to be grouped according to size. After they were split into two groups of 5, the next question was who will be the the pigs and who the birds? Consensus could not be easily had, even within the groups. In the end, a girl suggested a vote such that whichever gets the most vote for pig or bird wins it. Brilliant! A vote was done and so emerged assignment of bird and pig teams. The next problems were: who’s going to write the answer? Who’s going to read the questions? Who’s going to announce we’re done? Throughout, the girls negotiated amongst themselves and figured out their own solutions. They decided that the fastest writer was the best thing to do. They also decided to take turns being the reader. They decided that they needed each other to answer the questions. The objective was to get through the 3 challenges in the quickest time in order to win. It was amazing to watch. I like planning and organising parties and sometimes I do over-plan. This became obvious when Ms10, then 6, asked for some ‘free play’ time. I’d like to think that I’ve somehow matured in this process, helped by my teaching experience. I am so proud to have ‘let go’ of control and allowed the kids to take some ownership and to struggle with the problem themselves. I piped in every now and then to ask the “essential questions” but for the most part, they did the job themselves. I’ve been writing a series of PBL posts but this is PBL in action. Can you recognise the elements I’ve been talking about in the past few posts? Now, this may actually be GBL – Games-based learning as well but I don’t feel knowledgeable enough about it. For the record, the pigs won. 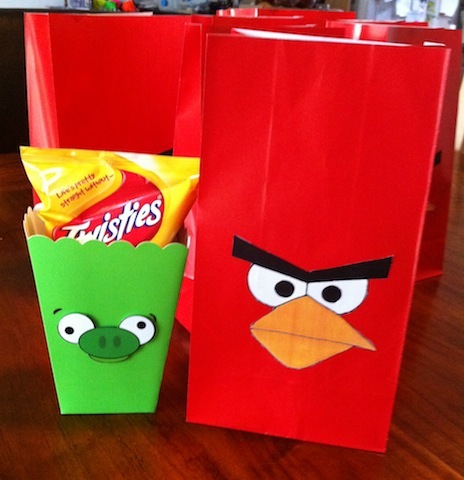 If you’re interested, here’s my epic post on Ms10’s Angry Birds party. I love the idea of this party 🙂 The ideas you came up with for getting the kids involved in the problem solving seemed so intuitive and organic, but I know how much sophistication sits behind those decisions! I too am interested by the request you later got for ‘more free time’. I wonder, what kinds of things did the kids want to do in free time? Is it just a case of wanting some unsupervised time, or adult-free socializing? Or do you think the use of maths puzzles seemed less playful than other types of game they might want to play? I don’t know about sophistication as such but I do know that some grounding in teaching/learning practices and principles allowed me to be more playful and go with the flow. Does that make sense? I tend to over-plan kids’ parties in fear of anyone being bored or left out or not having fun…you get the idea. No one has ever complained about my structured games – particularly because in my games, everybody wins – so that’s not the issue. The plea for ‘more free time’ is not so much about supervision but just having no agenda, literally. So now, I actually ‘schedule’ free time but always with a watchful eye to make sure no one is bored, left out, not having fun, hurt etc. Kids like to play together and I don’t think they get enough opportunities at school. Birthday parties then provide these opportunities where they get to make up their own games and just happy to be with each other.